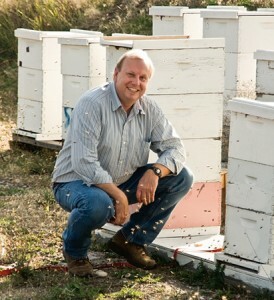 A BYU alum has made friends with honeybees in an effort to make the world safer. Colin Henderson and his University of Montana colleagues have turned pests into partners, training bees to locate buried land mines. While bees have been valued since earliest history for the honey and wax they produce and the crops they pollinate, scientists are discovering they possess remarkable abilities that can be used to find land mines, drugs, and even decomposing bodies. “Bees have an acute sense of smell and can be trained to identify and search for specific odors,” says BYU alumnus Colin B. Henderson (BS ’76), part of a scientific team at the University of Montana whose nationally recognized research centers on bees. The team uses traditional Pavlovian methods to train the insects, associating a food reward—sugar syrup—with a chemical of interest to their research. In this case, that chemical is TNT, the explosive used in land mines. Working with the U.S. Department of Defense, the team has demonstrated how trained honeybees can serve as a distinctive biological detector to zero in on buried land mines—a problem that endangers populations around the world. Following vapor plumes to the target odor, bees are able to detect even extremely weak scents from land mines. In one of the research team’s tests, the trained bees found 98 percent of the buried test mines. “The one we missed was sealed so tightly, it didn’t produce a scent and was undetectable by any method,” Henderson explains. Henderson says if land can be verified as safe, it can again be used for food production. In addition, Henderson, who was re-cently named his university’s most inspirational teacher by graduating seniors, has been involved in research to improve honeybee pollination in crops that repulse them, such as onions. He is also investigating what agents may be contributing to Colony Collapse Disorder, a phenomenon in which worker bees from honeybee colonies abruptly disappear.